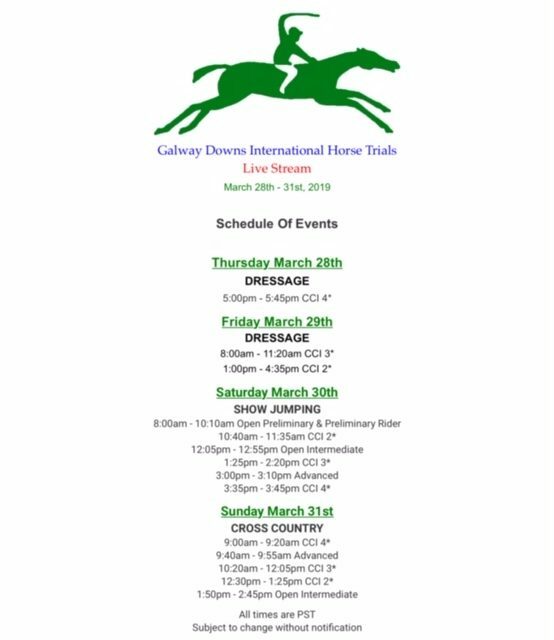 The 2019 Galway Downs International is underway in Temecula, California, and thanks to our friends at Ride On Video we can all follow the action as it unfolds! Watch the live stream via the embed above or click here. #ProTip: You can sign up for text alerts from Ride On that will ping you when the event is streaming. The CCI4* completed dressage on Thursday, with Frankie Thieriot-Stutes and Chatwin taking the early lead on a score of 28.8. This pair is Kentucky bound and greasing the wheels in the lead up to their CCI5* debut. There are seven pairs in Galway’s CCI4* division, with Emilee Libby and Jacobi sitting second and Tamie Smith and Wembley rounding out the top three. We’ll be along shortly with a dressage report.